What’s The Best Price for The Ariens Snow Tek 920402? If you’ve already made your mind up about getting one, you’ve also probably determined a budget. You can’t afford the equivalent of a new car. That’s fine. Not everyone can or will want to. There’s options out there that will meet your budget, and do exactly what you want it to. The Ariens SnoTek snow blower is one that comes to mind. Right off the bat, let’s talk about how nice it is to have electric start when the days or nights are bitter cold and you’re having a hard time getting it to start. With electric start, you just plug it into an outlet and start the snowblower like you normally would. Once you get it started, it’s time to get moving. We like the Ariens Sno-Tek 920402 especially for covering a lot of ground in a short amount of time. Because let’s face it, no one wants to be outside longer than they really have to be. 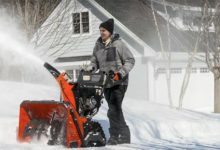 Compared to some of the other snowblowers Ariens make, this particular machine is at the lower end of the price spectrum. Now, cheaper pricing usually means poor quality that inevitably ends up with the machine falling apart within months of buying it. But this isn’t the case here. 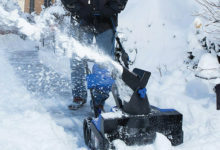 For an affordable price, you can have one of the best snow blowers that will tackle the majority of the snow conditions with ease, and cover lots of ground quickly. We think if you were to operate this machine and another that was significantly more expensive, you probably wouldn’t be able to tell the differences between the two. We did notice there were some complaints by consumers saying that this snowblower sometimes has a difficult time starting after a year, or won’t start at all. We think this problem could be avoided if after every winter use you take the time to drain the gas completely from the engine. This will keep the engine clean and from becoming gunked up as the temps cause the gas to heat up and cool down. It’s simple maintenance, really. Either that or you could add a fuel stabilizer. 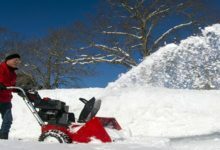 We do recommend you go through owner’s manual and prepare the snowblower machine with the service routine before you decide to bust it out for the first time. After a few adjustments and proper lubing, the machine should start right up! With steel augers and multiple speeds, the Ariens Sno-Tek will power through nearly all terrains without a problem. A 24-inch clearing path and a 205-degree quick-turn chute make the chore of shoveling snow a quick and easy job. If you’re working with more than 12 inches of snow, you can remove the axle pins to help improve maneuverability. By doing this, you’ll get additional traction. But keep in mind that it already comes with one wheelset to turn, and this will work fine for average to heavy wet snow conditions. If you have a large property to cover or do driveways for the neighborhood, you’ll be able to cover a lot of ground with ease and without having to stop and adjust settings. 12 inches of snow are cake. 25 inches and more are just as easily done, although drift cutters would be nice for larger heights. The controls are easy to operate and intuitive to use once you’ve read the manual. You could still probably operate this machine if you’re experienced with snowblowers already, but we still recommend spending some time with the owner’s manual first. Now let’s talk about the special features of this snowblower. 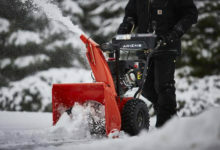 The Ariens Sno-Tek comes with interlocking control levers so you can keep one hand free to maneuver the snow chute without having to stop and adjust it when you encounter obstacles. The steel dash panel is weather-resistant so it won’t rust when exposed to wet snow. The dash is organized and isn’t cluttered—but can take some time getting used to. It has a 24-inch wide path with a 20-inch tall housing so it can handle average to heavy snow conditions. 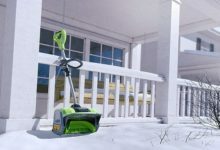 The large freeze-resistant 12-inch blade combines three blades into one so you can throw snow faster and get back inside your warm home quicker. 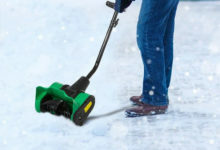 The steel augers have serrated edges to help quickly pull in the snow in its path and help break down tough icy chunks. The tires will resist slippery conditions with a non-slip tread that will cover ground faster than some other snowblowers of the same size. This snowblower comes with pin locks so you can remove them to improve the handling of the machine. By removing the pin locks, the machine won’t be so “stiff” and you’ll get more maneuverability. Some higher end units come with a built-in LED headlight. This one doesn’t have one and we think that for how much it costs, it should come with one. If you’re set on this machine and want a headlight, then you can probably get something setup without having to modify it too much. The oil drain bolt is above the wheel and can be difficult to access in order to drain the gas at the end of the winter. Unless you add fuel stabilizer, not draining the gas when you’re done using it can ruin the machine costing you several hundreds of dollars. Note: you only need to do this when winter is over. If you’re looking for a machine that can handle smaller areas or maneuver easily around vehicles and other obstacles, you might want to consider a smaller light-weight machine. 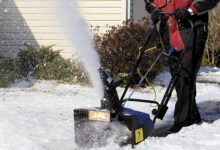 Just know that lighter machines are usually limited by what types of snow they can handle (powdery and light snowfall). The reverse gear on this snowtech snow blower can be slow, so you’re better off just pulling the machine backward yourself. We think for the price you get, this machine actually comes out ahead of certain other snowblowers that are at or above this price range. Granted, you won’t get all the luxury features like heated hand rests or LED headlights, but the ability to tackle snow past 12 inches quickly, certainly captured our attention. We think for its capabilities and quality construction, this price tag on this snow machine is reasonable. If you looked harder, you might be able to find another snow machine that does the same thing with a few extra touches, but every machine comes with its own quirks. There’s also a range of official accessories which can be purchased separately if you want to pimp your snow blower. Consumers who purchased this snowblower seemed to like the product but those who didn’t complain about how heavy this thing is. At 204lbs this thing is a beast and probably not the lightest thing that could be found in anyone’s shop. The reverse gear is slow as well. Overall, aside from those two complaints, most consumers were pleased with it. 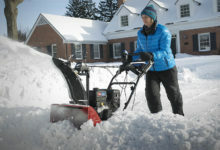 Not all snowblowers are built the same and this is certainly true for the Ariens Sno-Tek. For under a thousand bucks, you can get a heavy duty machine that is as reliable for average snow loads as well as heavy snow loads. For beginners or people who just want to be able to start this machine right up without memorizing a bunch of gears and levers, we like how simple it is to operate. Anyone who’s ever used a snowblower before will be able to use it right away. If this is your first one, however, the owner’s manual makes for a quick read so you can get started as soon as possible. The only thing we wish was different about this particular model is that it lacks headlights. Sometimes clearing snow happens in the middle of the night and you may not be so lucky to live in a neighborhood that has streetlights. A quick fix is to pick up a LED headlamp or make some of your own modifications, which some consumers have reported doing exactly that. Overall, if you’re looking for an affordable heavy-duty machine, be sure to consider the Sno-Tek 920402 by Ariens and you won’t be dissapointed.